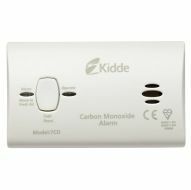 Kidde battery powered Carbon Monoxide alarm / detector with 10 year warranty. Carbon monoxide (CO) is a highly poisonous gas that has no taste, colour or smell. 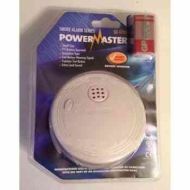 This battery smoke alarm with ionisation sensor can warn of smoke and fire even before flames are visible. 9V battery operation (battery included). Low battery warning signal. Functional test button. Extra loud sound. Compact size (108mm dia).